Andrew "Frij" Petrie "SOMETIMES controversial, ALWAYS..The Frij"
other team's tough guy, and win. Still playing: I'd have to say Joe Sakic. Small guy - huge heart. Pet hate? : People making decisions about the future of a sport in which they have never played. Please include that there are a few notable exceptions to this, but they are few and far between. KB: Did you prefer playing as Captain of the Australian team or Coaching? Frij: The player in me would always rather play. But Coaching the team in Czechoslovakia was a definite career highlight. I have huge respect for every member of that team, because they are the first National Senior team I've been involved in - player or Coach - who were disciplined enough to play defense first and put their egos aside for the good of the team. And that includes every team I've played on. It was a very gratifying experience for Myself and Matt Pease, and I hope the members of the team also. KB: Were the two jobs similar? Frij: No. Completely different. As a coach, all you can do is try and prepare the team as best you can. To create an atmosphere where they are all on the same page and striving for the same goal. If you do that well, and you have enough character on the team, then you will go far as a coach. Unless you get removed from the job of course. KB: How do you think the team will go in the future? Frij: I wish every Australian team the very best for the future. And I know that if we field our strongest possible teams, we can compete against any opposition. KB: Compare hockey in Melbourne to that in Sydney. Frij: The funny thing about hockey is that if you have a good bunch of guys in a group, then it ultimately doesn't seem so important which Jersey you wear. 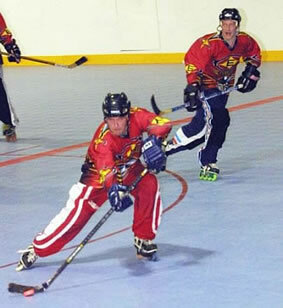 With Inline Hockey, the simple fact of the matter is that both groups ofguys involved in both states, are great guys. That group comraderie isthe one aspect of the game that I know I'll miss most when I stop playing. Moving to Sydney in terms of Ice Hockey was a more difficult change. Having played for Victorian State teams in many bitter VIC v. NSW games over the years, it was difficult to pull that NSW Jersey on for the first game of Goodall in '98. But that first season of club hockey up here with the Blacktown Bullets was an awesome experience. If I were to be honest I'd have to say thet the Ice league in Sydney was much more competitive than that in Melbourne. Faster, bigger teams, far more imports and more depth on teams all contributed to make that season my favourite of all I've played in Australia. We had a good team of guys who loved playing AND partying together. It was fun to be part of. And we won it. In terms of talent, the truth is that both States are fortunate to have a lot of good senior players who get involved in coaching, and a lot of juniors with enough raw talent to be able to benefit from that senior involvement. KB: Now that you are no longer in the industry do you enjoy hockey more? Frij: I've always loved the game of hockey. That's why we play. KB: How long did you spend overseas? Frij: 10 months as a 16 year old and almost 2 years in my mid twenties. KB: Did you see your time in Canada as a hockey apprenticeship or were you there on a holiday? Frij: Any time you have an opportunity to play hockey with and against players who are better than you, you can't help but learn and improve, so in that sense, both trips were an apprenticeship. But by the second trip came around I knew I was well and truly not good enough to be anything more than mediocre as a player. KB: While in Canada what was your greatest thrill? Frij: Attending NHL playoff games in Vancouver. Absolutely unbeleivable. Even if I do it again as a 50 year old, I know I'll always feel like a kid at every game. Frij: My first practice was in 1978. Frij: Luck, as with most Australians who take up the game. But it was the best thing that ever happened to me. I love the game and always will. Frij: Probably scoring for Australia against Finland off a beautiful pass from Johnny T in Minneapolis in 1996. But it felt awesome as Coach going into the rooms at halftime in Czech being 4 - 3 up over Slovakia last year. I was bursting with pride over the way the boys played that game. KB: Who do you most enjoy playing with? 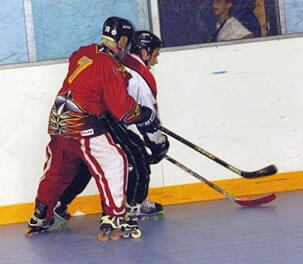 Frij: In Inline, You can't go past Kris Gailloux as a linemate. I think he proved at this year's Nationals that he is the best all-round player in the game in Australia. He's a natural finisher, and I'm more of a playmaker I guess, so we compliment each other well. KB: Is there anyone who you missed out on that you would have liked to have gotten the opportunity to play with? Frij: I've been really lucky in Inline to have played with and against all the top players in the country at some stage, from veterans back in '96 through to some of the stellar juniors coming through today. KB: Anyone you would have liked to have play against? Frij: Same answer as above. I have a lot of respect for guys who play the game tough but fair. That's pretty much how I try to play it myself. Frij: I'd honestly like the opportunity to develop the National Senior team in tandem with Matt Pease as assistant Coach. Over a three year period. We thought we had that commitment from the AILHA powers that be and after our Team's great results in Czech last year, I would have liked to continue. The AILHA decision makers decided against this. Frij: Obviously we need more Quality venues dedicated to the sport. And we also have to try to cultivate an atmosphere whereby administrators and decision makers have the interest of the sport at heart. I'm probably hanging myself in saying this, but for the most part, in my opinion, that is simply not the case today. Will it ever get there? I truly hope so. KB: When you are not playing hockey what do you do with your time? Frij: Go to the gym, golf, and working six days a week. Time to grow up I guess. KB: If you could add or improve on one element of your game what would it be? Frij: Like all overweight players, I'd like to be faster !!!! Any closing comments? Fate is a funny horse, it sometimes throws you - but it always let's you get back on.